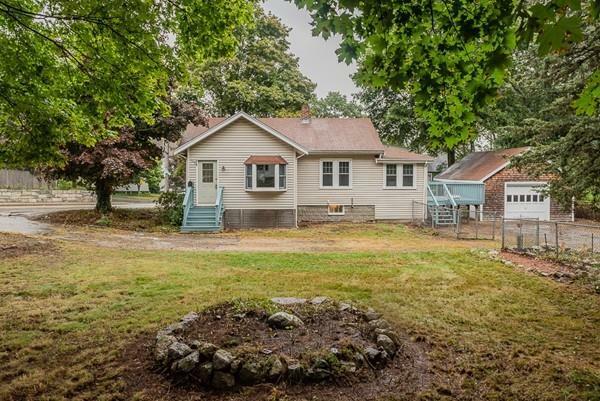 Great piece of land and lots of charm for under $350K in Braintree! High ceilings in most rooms keep you from feeling closed in, plus the main living areas are open to each other. Enter into the den with a picture window, roomy living room with ceiling fan, and an eat-in kitchen with laundry hookups (washer & dryer included) in the mudroom area near the door to the deck. Three bedrooms, all with closets, or use them however you want; home/office, TV room, computer area, playroom, etc. Roomy side yard plus plenty of off-street parking, including an over-sized one-car garage with work area, plus a fenced-in back yard space for pets etc. Nice deck to enjoy the warm weather days. House was freshly painted inside, and is cleaned up and ready to go! New water heater 2018, boiler has had extensive work done to it per the Seller, and a new oil tank. Convenient spot in East Braintree close to the Landing, and a short drive to the T and Routes 3/93/128. Come see!